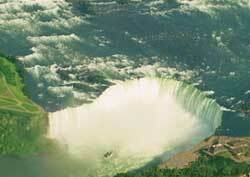 It is one of the mightiest falls on earth. Although Niagara Falls is smaller and less breathtaking than Iguazu Falls in South America and Victoria Falls in Africa, it is awe-inspiring in its own right. Summer is best in terms of water fall strength. The greater the volume, the more spectacular the viewing experience. Unfortunately, summer is the season when the lion's share of the 15 million annual visitors come. Crowds can be overwhelming and line waits unbearable. Winter can be bitterly cold, a major factor considering that watching the falls is primarily an outdoor standing activity. Moreover, in deep winter, layers of ice can hide the falling water. The two best compromise times are early May and late September. Avoid long lines by scheduling your visits to the popular attractions in the morning (before 10:30 a.m.) or late afternoon (after 4:00 p.m.). And, if possible, avoid weekends.